Summer vacation is here and classrooms across America are empty. We only know of one art room that is open all year long. The doors to Miss French Fry’s art room never close because she has mirrored the creativity her students experience in school with a bright, constructive and amusing blog, http://missfrenchfrymakesart.blogspot.com/. “Teaching art is my dream job,” says Melinda Donelan (a.k.a. Miss French Fry). “I like to use my blog as an outlet for sharing some of the fun things we work on in the art room.” And share she does. About twice a week, Donelan publishes posts that show projects her students are working on as well as classroom décor/organization tips. Sometimes she even gives her readers a sneak peek into her personal life by revealing what she is making for dinner and her wardrobe selections for the week. What sets this art teacher’s blog apart is her fusion of creativity and organization. Every post focused on art education starts by introducing the project and the inspiration behind it. Maybe she traveled to a museum or was inspired by a famous painter from the past. She explains how she does this intentionally, “When I develop lessons, regardless of what the objective is, I like to ensure that the projects tie in with something else, whether it’s a cross curricular connection or a piece of literature.” After tying each project to a deeper purpose, she springboards into the details of the project and shows her students bringing their artwork to life by using pictures. She has lots of pictures that show readers what the students are doing step-by-step. She also shows a finished project, too. Miss French Fry’s blog posts can inspire more than just art teachers. All teachers could benefit from some of her posts. 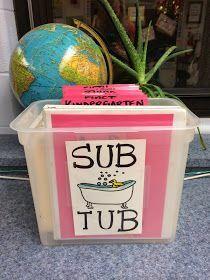 For example, the “Sub Tub” is an organizer she has created to store and label lesson plans for substitute teachers. All in all, her clever instructions make it simple for any teacher to feel prepared when they leave their classroom in the hands of a substitute. In this 24/7 world, always accessible art education resources are hard to come by. With her blog, http://missfrenchfrymakesart.blogspot.com/, Melinda Donelan is changing this. Explore the adventurous, industrious and sometime wacky world of an art educator. Get some fresh ideas and walk away feeling encouraged and more creative. Is an art education necessary? What does a Good Art Teacher Look Like?